My mind wanders and I’ll confess that I cherish lovely and classic things … iconic fashion pieces that have withstood the test of time. My thoughts bring me to some of the more well-known French design houses like Coco Chanel, Hermes, Dior, Yves St. Laurent or Rene Lacoste. When I think of the most elegant things, I think of the French design houses mostly. I’ve never had the lifestyle or money to take full advantage of some of the most beautiful and classically iconic things. My discovery of them and deep appreciation of the skill and craftsmanship involved in their creation allows me to spend time with them through the creation of my art. My art expression is my simple homage to classical beauty. The pieces below are part of my new “Icon Series”. I’ll also include people who encompass the heart of beauty. My first one is “Jackie O or Jacqueline Kennedy Onassis with her Pillbox hat. “Timelessly Jackie” wearing her classic Pillbox hat with a beautiful jacket. 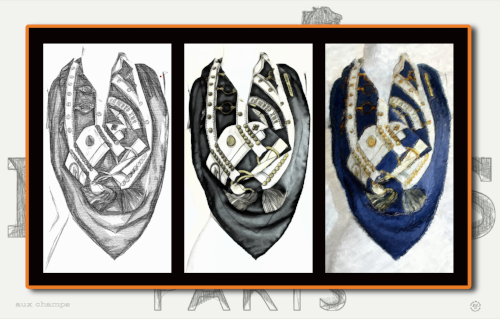 “aux champs” in dedication to the Hermes classic scarf done in three frames. The Hermes Kelly Bag - in honor of the classic starlet Grace Kelly. “iconic” the Chanel Tweed jacket.